A circulated coin graded VG-8 is well worn. Major design elements are visible, but with faintness in areas. Head of Liberty, wreath, and other significant features are visible in outline form without center detail. LIBERTY is mostly worn away. In the 1970s coin grading was a very subjective process. 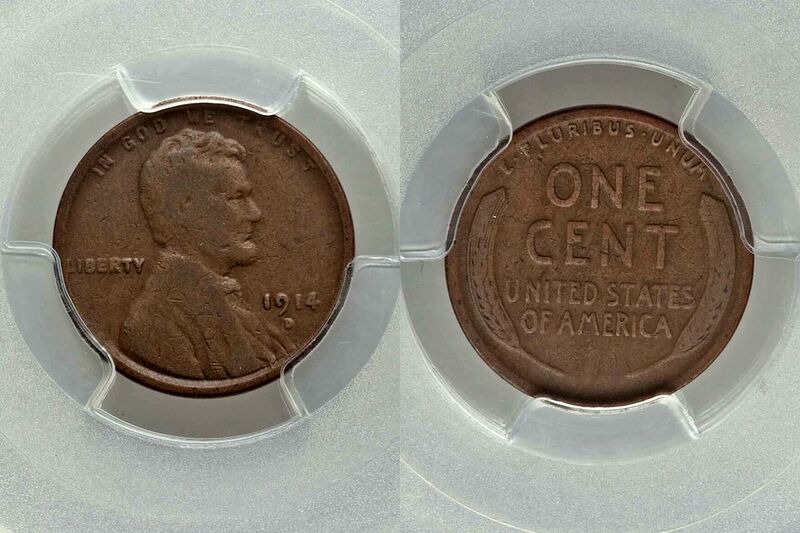 What one coin dealer would call "very good" another coin dealer might call "extremely good." This lack of consistency caused confusion among coin collectors and coin dealers since the terminology was not consistent. Other coin dealers adopted the Sheldon Scale for grading United States coins that were based on a numeric scale from 1 to 70. Where 1 was the lowest grade and 70 was the highest grade ("the perfect coin"). The American Numismatic Association got involved to standardize grading terminology and descriptions. The organization formed a committee of coin dealers and professional numismatists and tested them to formulate a grading system. This committee met with various collectors and dealers across the United States to get their input. The result was a book titled Official ANA Grading Standards of United States Coins that was first published in 1977. Coins were illustrated with pen and ink drawings and the information was very similar to another text titled PhotoGrade, Official Photographic Grading Guide for United States Coins. Although the book was comprehensive it would take several more edition over the coming years before true agreement on grading terms and descriptions would be obtained. The exact descriptions of circulated grades vary widely from one coin issue to another, so the above definition is only very general. It is essential to refer to the specific descriptions for a particular coin type when grading coins. While the preceding guidelines will undoubtedly prove useful to the reader, it is strongly advised that viewing actual coins in the marketplace will enable you to determine better grading practices affecting the series which interest you most. For example, the collector of Morgan silver dollars would do well to examine Morgans graded by a variety of services and sellers to determine in general what is considered to be MS-63, MS-64, MS-65, and higher grades. Early American coins such as the half-cent, large cent, half-dollar, silver dollar, and Colonial issues are more difficult to grade than more modern issues. This difficulty is mainly due to a slow manual process of producing coin dies. Compounding this process even further is the lack of consistency in the striking process. The first coin press used at the United States Mint was a hand operated press operated by two men. Each planchet was individually fed by hand into the coining press. The second operator would spin and heavy weighted arm to produce the downward force and strike the coin. Given human nature, some coins would be struck harder than other coins and all the design detail would be impressed on the planchet. If the coin was not struck with the required pressure, the design details would be weakest at the highest points on the coin. This would give the illusion of wear on a coin that actually has never circulated. As the minting process progressed, the introduction of steam-powered coining presses produced better results. Additionally, the coin die making process also improved. Early dies were engraved by hand and quality varied within the same issue. New coin die production process included automation that ensured all coin dies for a particular coin type were virtually identical. The current modern minting process includes hydraulic coining presses that deliver a consistent pressure to optimize striking quality. Coin dies are now produced with computer aided manufacturing processes. Whether a million coins are produced or a billion coins, this modern minting process ensures consistent high-quality coins are always minted. Some content reproduced with permission from The Official American Numismatic Association Grading Standards for United States Coins, 6th edition, copyright 2005, Whitman Publishing, LLC. All Rights Reserved.